“It’s a beautiful day and… Whoa, check out the neighbor’s yard; it is so much nicer than mine. How does he do it? Should I care? I mean, I could just enjoy the view and go on about my day, but something about it bothers me. I thought I was taking pretty good care of my yard and then this guy moves in. Suddenly, if my yard looks like anything short of a putting green, I’m some kind of bum; just who does he think he is?” Have you ever had thoughts like these? If so, you are not alone. There is a struggle in America, a battle actually. Millions of people devote large sums of money or their precious free time trying to make turf grass thrive in climates that are nothing like the cool, wet places where these plants originated. The task is made all the more challenging by the desire to keep the grass uniformly short and brilliantly green through every season of the year. Did you ever ask yourself how it came to this? Ted Steinberg can provide you with answers in his book, American Green: The Obsessive Quest for the Perfect Lawn (W.W. Norton & Company). With a keen sense of humor and a balanced perspective, Steinberg relates how we have reached a point in this country where every family, regardless of means, is expected to maintain a landscape designed to showcase the wealth and power of English aristocrats 300 years ago. If you add up all of the turf landscapes, including athletic fields and golf courses, “the lawn is one of America’s leading ‘crops,’ amounting to at least twice the acreage planted in cotton.” That is an area somewhere between the size of Kentucky and Florida that requires mowing this week, so you may as well cancel that tee time on Saturday. Before the automobile, people either lived in town or in the country. What little property an urban family owned that wasn’t covered by their house was likely planted with vegetables, or maybe flowers. Rural families were busy clearing and turning every bit of woods and prairie into cropland or pasture. The idea of spending time and resources on a patch of ground you just look at, or at best play on, came later. As cars became increasingly more affordable, urban lots grew in size, creating more room around the house for…something. Initially gradual, suburban growth exploded after World War II, creating opportunities for a new type of home builder like Abe Levitt of Long Island, NY. Where all homes were previously built by or for a specific individual, Abe and his sons created a system where homes were mass-produced and the finished houses sold to individual consumers. They all had lawns because, as Abe said, “A fine lawn makes a frame for a dwelling.” He built 17,544 of them in Levittown between 1947 and 1951. All of those Levittown homeowners soon found that keeping a lawn was a lot of work. Mowing during the growing season and watering during the dry spells were just the beginning. Lawns that you could be proud of and wouldn’t lower property values required reseeding and fertilizer as well. The Scotts Company in Marysville, OH seized the opportunity. The company had made a name for itself and thrived selling crop seeds of commendable purity. In 1928, they launched their Turf Builder brand fertilizer and began publishing Lawn Care magazine. Subscriptions, while free, had to be requested. Eventually published in 16 editions, Lawn Care showed aspiring turf perfectionists how best to use the company’s products in their particular soil and climate. In the 1930s, they introduced a spreader to improve the consistency of fertilizer coverage. After the war, they combined fertilizer with 2,4-D, a broadleaf herbicide the military had developed. Eventually marketed as “Weed and Feed,” the product became the second link in a familiar family of products. Targeted at dandelions, it also killed clover. Since clover is a plant that takes nitrogen from the air and returns it to the soil, killing clover actually increases the need for the fertilizer. In the 1950s, pre-emergent herbicides were added so that homeowners could prevent crabgrass they may or may not have had. 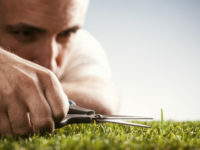 American Green goes on to describe how lawn care evolved from a do-it-yourself activity into a task many people hire out. Whether for the chemical applications or the weekly mowing, an army of workers in trucks are moving through suburban America on any given day. They “mow, blow, and go,” leaving the homeowner with ringing ears, a bill, and a lawn to be proud of for the next few days.